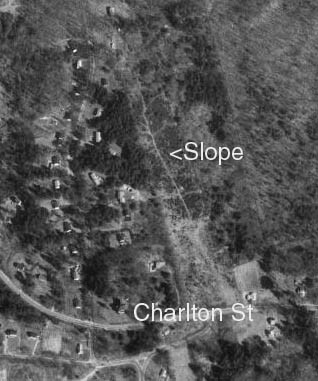 "I know nothing about it, but the old USGS topo sheets showed a "ski area" in Oxford, MA, on the N side of Charlton St., about 1.5 mi. W of the center of Oxford, just before the intersection of Conlin Rd. Probably just a former rope tow. I have watched it go from a field, to a grove of small pines, to house lots over the past 25 years." 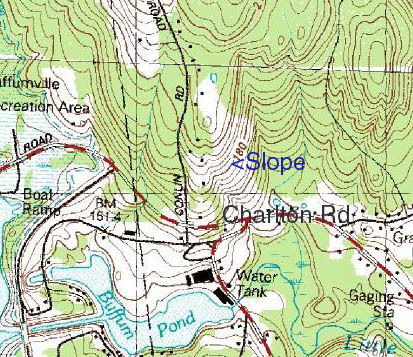 To the right is a topo map of the area, showing the slope. The Terraserver map shows the area clearly, grown in.